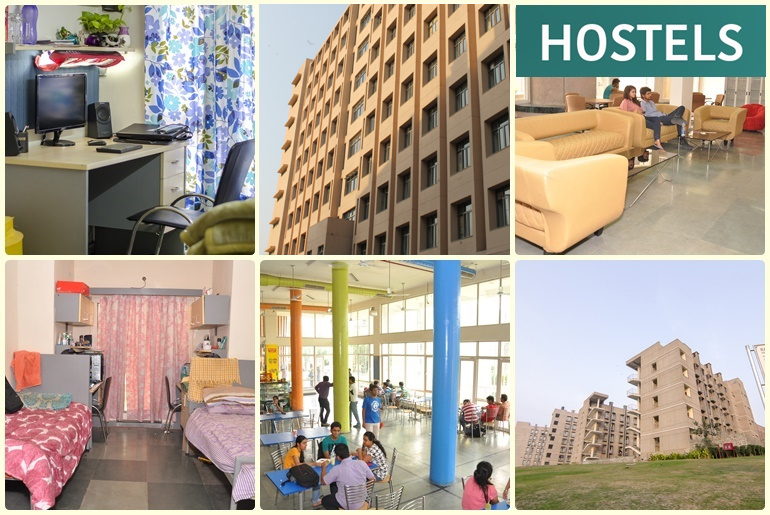 IIIT Delhi provides accommodation to students wishing to reside in the hostels. At present, there are two hostels, one for the boys having 372 seats and another for the girls with 164 seats. Each room in both the hostels is provided with furniture needed by a student - bed, table, chair, bookshelf, cupboard, etc. The rooms are provided night time air conditioning in summers, and heating in winters (Schedule for AC available online. High-speed Internet connectivity is also available in hostels. There is a common mess for the boys and girls which function during the working semester. Air conditioning is provided in the mess during lunch time. During the winter and summer vacations, a special mess is run for students who are required to stay in the hostels for pursuing academic, sports or cultural activities. It is compulsory for all hostel residents to avail the mess facilities. Day-scholars can eat in the mess by paying the meal cost as notified. In addition to the common mess, there are two cafeterias, one located in the academic building and the other in the common mess building which caters to the needs of the students and faculty. All hostel students are completely free to move around the campus at all times, and some of the study areas are open 24x7 for the benefit of students. Each hostel also has a Hostel Committee which is an advisory body comprising the Dean (Student Affairs) and the elected student representatives as its members. The Hostel Committee also coordinates with the Mess Committee for the running of the mess. Students can relax in the evenings or on holidays, or spend their leisure time in the Common Room which is equipped with a TV, newspapers and magazines. Sports and other recreational facilities are available on the upper floors of the dining building. An external security agency has been contracted for providing security at the hostels. The services of the security personnel are monitored by the GM-Facility Management Services (FMS). Besides, a Mess Committee is also formed out of representatives from hostel committees and day scholars. The Mess Committee monitors the quality, taste and hygiene of the food served in the mess. They also interface with the mess vendor to provide him with the feedback of students and effect changes in the weekly menu. Periodical review and inspection of the quality of food items also form part of their duties. Based on the recommendation of the Hostel Allotment Committee, the hostel is allotted to eligible students by the Hostel in-Charge. PhD and M.Tech students along with the students from outside Delhi are given preference in hostel allotment. Online applications are invited during vacations for existing students.Only 60 percent of the institute’s students can be accommodated in the hostels. A regular student was charged Rs 60,000 annually, for single room occupancy last year , while on the twin-sharing basis an amount of Rs 45,000 per annum is charged. For girls, the option of triple sharing is also available, for which each student has to pay Rs 40,000 annually. Hostel fees are revised annually. Mess charges may be between Rs 8,000 and Rs 10,000 for four months. Any act of intimidation or violence, willful damage to property and drunken riotous behavior constitute an offence. Smoking, use of narcotics, consumption of alcoholic beverages and gambling are strictly prohibited. Damage caused to any room or common areas of the hostel, unless due to natural wear-and-tear, may be charged to individuals causing the damage, or residents collectively. Hostel residents are not allowed to keep motorised vehicles on the campus. Hostel residents are not allowed to leave the campus after midnight. A non-resident cannot stay in the hostel overnight. Cooking in the rooms is prohibited. A student's parents and other same-gender guests may visit the student in his/her room from 8 am – 8 pm. Any other visitor can only be met in the common room of the hostel. Contact: Hostel related communications shall be done via only admin-hostel@iiitd.ac.in. Emails sent to any other email id will not be entertained.